Black and white negative showing the construction of the Whitby Community Arena. This photograph shows the front of the arena from Ontario Street. The Whitby Community Arena was built between 1953 and 1954 on the site of the Burns and Taylor arena, the block bound by Ontario, Green, Gilbert, and Brock Streets. The Community Arena was official opened on 29 September 1954. It operated until 1972, when it was condemned under provincial building standards and demolished. 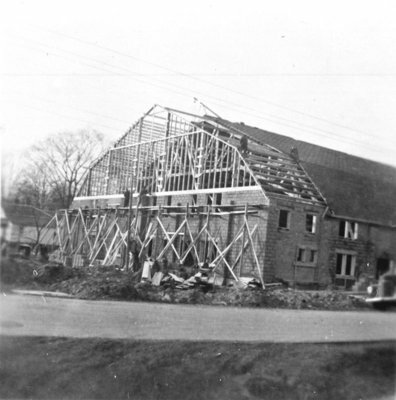 Construction of Whitby Community Arena, 1953, Photographer Unknown. Whitby Archives 21-003-013.